Plot: Some similarities to the Ramayana, as five princes undergo exile in the forest before waging a war with their cousins, although in this case, to regain their kingdom. Within the great expanse of text, there are many side stories, including the tale of the Ramayana read earlier, and a whole section discussing dharma (the correct way to live) of kings and warriors which has gained its own title – the Bhagavad Gita, and has had a deep impact on Hinduism. 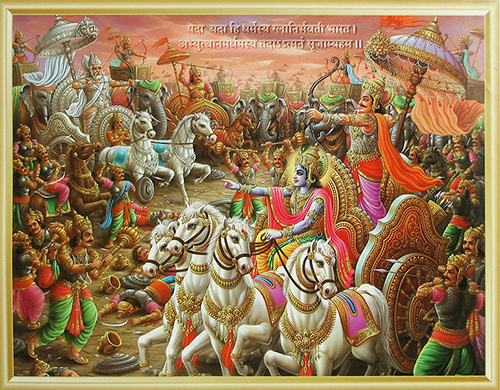 My thoughts : The Mahabharata is the very definition of epic. The abridged version I read still ran to over 790 pages, but the original in Sanskrit can run to 32 volumes. I felt that the Mahabharata was much more gritty and less fantastical than the Ramayana, despite the presence of gods, demons, supernatural weapons and superhuman stamina and abilities of the various heroes and their anatagonists. Much of the story centres on the battles of the war, with each encounter between heroes showering each other with thousands of arrows; and chariots, horses, elephants and drivers destroyed in their hundreds of thousands. “his weapon…. was as unbearable as a flesh-eating ghoul” p. 523 – What??!!! “ Bhrgu’s son Cyavana performs [religious] austerities for so long that he becomes an anthill” p. 189. This has to be the most bizarre and random opening line of a chapter in the whole of world literature! And finally, not so much a favourite as a jaw-dropping image repeated several times descibes a battle so ferocious that …”with his torrents of sharp arrows the wearer of the diadem set a dreadful river flowing on that battlefield: its water was blood from the wounds of weapons on men’s bodies, its foam human fat ….. corpses of elephants and horses formed its banks, the entrails, marrow and flesh of men its mud. Ghosts and great throngs of demons lned its banks. Its waterweed was hair attached to human skulls, its billows severed pieces of armour … fragments of the bones of men, horses and elephants formed the gravel of that fearful destructive, hellish river ; crows, jackals, vultures and storks, and throngs of carrion beasts and hyenas were approaching its banks from every direction” p.377. Personal rating : plenty of great ratings for the Mahabharata on http://www.goodreads.com, so I don’t feel too guilty giving this only 4/10. Just too long to enjoy (as The Prince said to Mozart in Amadeus), and I didn’t feel the ‘heroes’ demonstrated true dharma – quite the opposite : Arjuna burning the Khandeva forest and killing 1000s of animals, Yudhisthira lying to Drona in the midst of battle, telling him that his son was dead to demoralise and defeat him, the five Pandava heroes not acting to protect their shared wife from the humiliation and torment of the Kauravas. Or maybe I still don’t understand the true concept of dharma. Next : The Homeric Hymns – not written by Homer, but are they hymns?